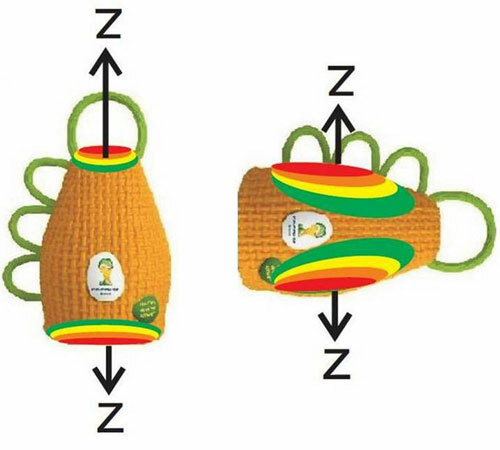 In 2014, Brazil will host the FIFA World Cup and Brazilian Musician Carlinhos Brown created the caxirola as the official music instrument for the event. The caxirola is an adaptation of an old African instrument, the caxixi, used for capoeira plays in Brazil (Gallo, 2012; Graham, 1991). In both instruments the sound is generated by hard particles impacting on the walls of a closed basket. The principal difference is in the material that compose them. While the caxirola is made of environmentally friendly polymer, the caxixi is handcrafted of natural components: seeds as impacting particles and a combination of a reed and a dried gourd for the basket (see Fig. 1). 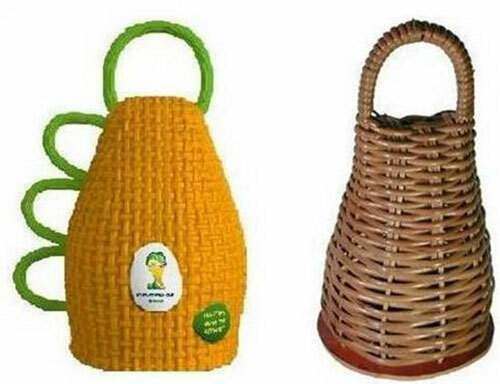 But, what is the difference in terms of sound generated by the caxirola, which is standardized, and the many types of caxixis that are handcrafted in Brazil? At the previous ASA meeting held in December 2013 in San Francisco we presented the two most common ways of shaking the caxirola: in longitudinal and transversal orientation (see Fig. 2). Also, we presented the results of measurements of the total sound pressure level (SPL) close to the user's ear, which was found to be 82 dB(A) for the caxirola shaken longitudinally and 74 dB(A) for the caxirola shaken transversally, both in free field conditions (Pozzer& Paul, 2013). Free field conditions mean that no obstacles and reflecting surfaces are influencing the way of the sound waves between sound source and microphone. The 8 dB difference found means that the caxirola shaken longitudinally is nearly as twice as loud at the user's ear as when shaken transversally. 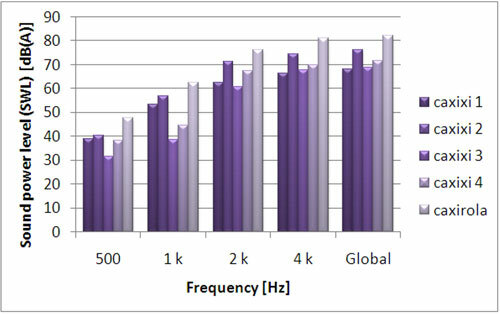 Nevertheless, sound pressure level is a quantity that relates to the sound at the receiver, not at the source. As we are also interested in the source we then measured the sound power level (SWL) for the instruments. The sound power level is an important quantity because it is an intrinsic characteristics of the source and doesn't depend on the room or the distance of the receiver from the source. Sound power level was measured according to two international standards: ISO 3741:1988 for measurements in a reverberation chamber and ISO 3745:2003 for measurements in hemi-anechoic chamber. For this paper sound power level measurements were made both for the caxirola and the caxixi. For the caxirola the measurements were carried in the reverberation and hemi-anechoic chamber shaking the caxirola both longitudinally and transversally. The SWL of four different caxixis (Fig 3.) was measured only in the hemi-anechoic room and shaking the caxixi longitudinally, which is more common for the caxixi. Four different caxixis were measured because they are handcrafted and therefore differ considerably in their specifications. The SWL measured in the reverberation room was 81 dB for the caxirola shaken longitudinally and 80 dB for the caxirola shaken transversally. In the hemi-anechoic room, the SWL was 81 dB for the caxirola shaken longitudinally and 78 dB for the caxirola shaken transversally. We see that the caxirola shaken longitudinally or transversally produces around 80 dB SWL. The SWL measured in the reverberation chamber when the caxirola was shaken transversally is 2 dB greater than the SWL measured in hemi-anechoic chamber shaking the caxirola transversally. This difference is due to small differences in the excursion and velocity of shaking but is not significant and doesn't make an audible difference because in practice differences smaller than 3 dB are inaudible for most sounds. For the caxixis shaken along its axis of symmetry (longitudinally) in the hemi-anechoic chamber the SWL was found to be 67 dB for caxixi 1 and 3, 70 dB for caxixi 4 and 75 dB for caxixi 2. As expected the SWL of different caxisis differ considerably, here by up to 8 dB. Comparing the SWLs measured for the caxirola and the caxixis we conclude that the caxirola produces always a bigger SWL than the caxixis tested, independent of the style of use, and in all frequency bands (see Fig. 4). Gallo, P. M. (2012).Caxixi: um exemplar da percussão afro-brasileira para reflexes de perspective etnomusicológicas. In Anais of II Simpósio Brasileiro de Pós Graduação em Música. Graham, R. (1991). Technology and culture change: The development of the berimbau in colonial Brazil. Latin American Music Review/ Revista de Música Latinoamericana. Pozzer, T., Paul, S. (2013). A first look into the caxirola – official music instrument of the Soccer Worl Cup 2014.The Journal of the Acoustical Society of America.